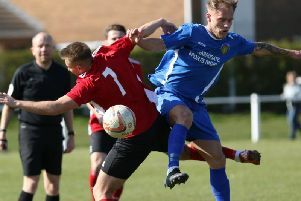 NCEL Division One leaders Knaresborough Town extended their unbeaten run into a 14th game when they got the better of Armthorpe Welfare at Manse Lane. Paul Stansfield’s in-form side have won 12 of those fixtures, including a 3-1 success over Tuesday evening’s visitors, which sees Boro go 12 points clear of second-placed Eccleshill United. After a fairly tight start to proceedings, it was the title-chasing hosts who looked the more likely as the half wore on, Rob Youhill forcing a fine save from Welfare keeper Mark Sanderson and Brad Walker volleying just wide. With just two minutes of the opening period remaining, Knaresborough eventually broke through when Walker finished off at the second attempt. Boro were handed the chance to double their advantage from the penalty spot eight minutes after the resumption, and Ben Parkes made no mistake, firing a low effort into the bottom right-hand corner from 12 yards. Armthorpe then stirred into life and debutant gloveman Tom Young, signed on loan from Tadcaster Albion following an injury to Jack Rushowrth, made a good stop to keep his new team’s lead intact. The visitors came again, however, and Gary Lumley acrobatically hooked the ball into the back of the Boro net just before the hour-mark, despite the best efforts of Young. Any hopes that Welfare may have had of a comeback were then extinguished in the 75th minute when Luke Stewart, a recent acquisition from local rivals Harrogate Railway, marked his debut with a goal that wrapped up the points.